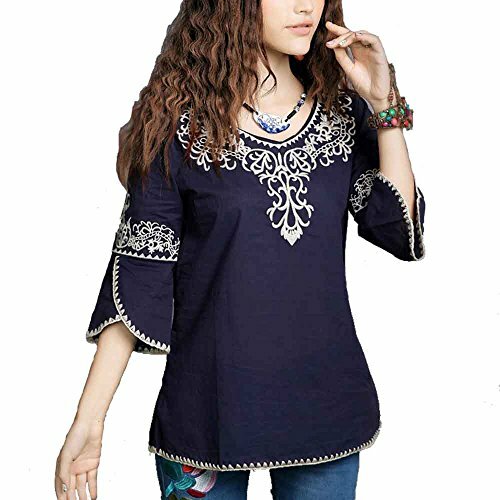 Ashir Aley New 2015 Floral Embroidered Butterfly Sleeve Wrap Peasant Blouse , Large, Style3 Navy | What Should I Say? Flowers pattered, fashion and charming, bell 3/4 sleeve peasant tops. Wear in spring or summer, match a jeans or shorts, looks great. Please note that due to limitations in photography and the inevitable differences inmonitor settings, the colors shown in the photograph may not correspond 100%to those in the items themselves. If you have any questions about this product by Ashir Aley, contact us by completing and submitting the form below. If you are looking for a specif part number, please include it with your message.